At the end of March, Brian Becker and Michael Baas traveled to Vassar College in Poughkeepsie, New York, U.S.A., to participate in the 2017 Vassar CommunityHack, a 2-day hackathon at which local high school and college students meet to celebrate a passion for coding. Dyalog was a participant and sponsor of the 2016 CommunityHack, where over 100 students were introduced to APL, and was glad for the opportunity to repeat this. 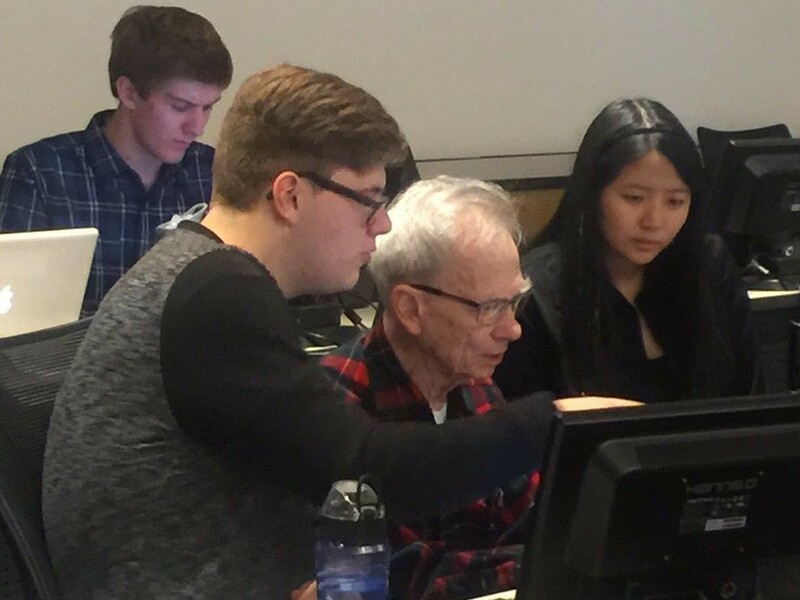 Brian and Michael were joined by Dr. Ray Polivka and Jon McGrew, both from the original IBM APL development group, to help students learn about APL and array-oriented programming. The team was accompanied by Lev and Dex, two of Dyalog's Ambassador Ducks. Ray Polivka, who has worked tirelessly to teach young people about APL, put us in touch with Vassar College and attended the Hackathon. Here he is, explaining the wonders of APL to the next generation. Lev and Dex, Dyalog's Ambassador Ducks! The team gave two presentations over the course of the hackathon on "Programming with Arrays" and "Why APL Should Be a Part of Your Software Toolbox". They also met with Dr. Marc Smith, chairman of Vassar's Computer Science department, to explore ways in which Dyalog APL could be beneficially used at Vassar. Thanks to Dr. Polivka's efforts, Dyalog APL is already available to Vassar students on the school's Linux system. The students were encouraged to participate in the 9th Annual APL Problem Solving Competition and to download a free copy of Dyalog APL to experiment with and learn the language, resulting in several students applying for personal or educational licences. Overall, this was a successful event. The organisers expressed great appreciation for Dyalog's continued support, dozens of students were introduced to Dyalog APL, and the use of Dyalog at Vassar is poised to grow.